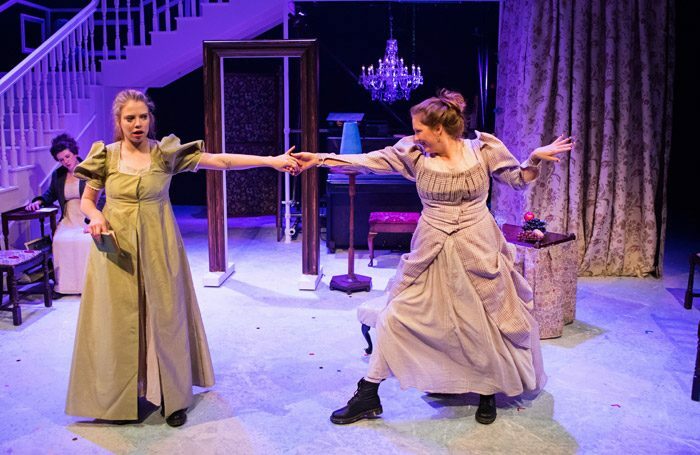 Isobel McArthur’s adaptation of the classic Jane Austen match-making tale is a merry dance: it’s a shimmy; a krump, a twerk,with skirts raised high. Featuring a killer karaoke soundtrack encompassing everything from Pulp to Candi Staton to the Divine Comedy and Etta James, McArthur’s play is knowing enough to be irreverent, but faithful to the heart of Austen’s story. This postmodern and absurdist production makes the most of Ana Ines Jabares-Pita’s ornate – Mr Bennet is represented by a propped-up newspaper on a chaise lounge. It also interrogates the desperation of a woman’s lot in the 19th century. So while Mrs Bennet is played for laughs by McArthur as a great big neurotic mess, her fears of never marrying off her five daughters to men with prospects are very much rooted in the sad reality of the period. Tucked underneath the utilitarian grey dresses (to mask the dirt) is the grubby truth that the family were living a piecemeal existence, and options for girls were limited to seamstress, poorhouse, or worse. Paul Brotherston’s production balances dark themes of child abduction, male privilege and dreary, sexless marriages in draughty homes, with a rollicking sense of period dramas and their swooning cliches. The cast, who effortlessly swap roles and genders, are excellent, particularly sardonic yet vulnerable Meghan Tyler as Lizzie Bennet, and Hannah Jarrett-Scott’s heartbreaking Charlotte, or her bumbling Charles Bingley. They also sing and play squeezebox, guitar, piano, and harp beautifully. There is still something gloriously subversive, after all the supposed in-roads made in female representation, to see five young women taking up space on stage in 2018: that they do so with charisma, wit and brio is remarkable.